Last month I installed 4 new Sebro slotted rotors as well as EBC yellow pads. I broke them in a performed the curing procedure per the instructions and all was good. Excellent braking feel and performance. Went out last week on the track for an AZ PCA DE event on the East Track Wild Horse pass and ended up in group DE3. I did 5x 20 minute sessions. The car performed really well, brakes exceptionally well, but upon coming back in the pits on the last session of the day (pushed hard), the front brakes were smoking. Today I drove the car some and found that it takes a big amount of brake pedal pressure to stop. No vibration or noise or sponginess, just lots of brake pressure. rears look in good shape. Here's a photo of the front right pads. Looks like they are sort of chipping off the edge. Are these pads damaged/cooked? Do I need to de-glaze them? Should I bleed the brakes? You'll end up finding that the pads have to be warmed up a little to feel like they did at the track. I have been thru at least 8 sets of EBC Yellows and this is normal. With so much grip, its easy to use the brakes to their maximum ability and get them hot as hell and then see a little bit of smoke when you come into the pits. Then, after a track day, they will not grip as well as they did at the track. After a little bit of driving and a little heat, they will return to normal. The pads are well cooked but not beyond their intended design so you should be good for your next event. Just be sure to regularly change the brake fluid (using a high temp fluid) since its getting cooked too. Have you noticed much difference between yellow and red on the track and/or on the street? Yellow has a much higher operating temp. If you brake hard on the track, you will get there. I used to use EBC Red on the track, it worked well for me and matched up well with the Hankook R-S3 tires I run. On the track I got plenty of dust but less so on the street. Looking back at my records I ran these pads from October 2014 through November 2016. In that time I ran 1 set of backs and 2 sets of fronts. 1st front set lasted 7500 miles with 8 track days. 3 of the fronts pads were still ok but one was getting pretty thin. I had read somewhere that you could/should swap brake pads around to even the wear. I did this and I think it accelerated my wear. Maybe I did it wrong but I ended up with one that was really thin compared to the other 3 so I had to replace. 2nd front set lasted 5972 miles with 11 track days, and I got the last few days by swapping around the fronts with the 3 good fronts I had from before and using the best 4 pads. Rear set 13472 miles and 19 track days and still had some life left in them. Jay has it right - the EBC Red is a trackable street pad. They performed well for me, but are not super long lived under those circumstances. I considered going to EBC yellow but at the last event I drove with the Reds, I was hanging out with one of my early instructors who has an F class Boxster S and he took me out in his car and I really liked the way his brakes felt, and he was using the Carbotech XP8/10 combo so I went with that. The Carbotechs were really noisy on the street until my first track day with them - since then thy have settled down "some". In my opinion they are a little too powerful to be matched with the Hankook R-S3, it is quite easy to get into ABS. They are well matched with a tire like the Nitto NT-01, tremendous braking power and control, easy to modulate, harder to get into the ABS. I'm running re71r's for my track days. I don't do that many, only 6 or 8 per season. Guess I should stick with the reds. Thanks for the input. RE71 is a sticky tire, yellow would be fine, also my son runs ebc yellow on his Miata, yellow is a great pad and he is still on the original set. Red is good too. But if you do more track they wear faster red is probably one of the lesser dust pads track pads that works on the street. His yellows don't squeal either. Edit: You have red right now? There you go, solved it is a great pad. When they run out, then you can decide what to do next, if you were happy with them, get them again. Last edited by steved0x; 03-13-2017 at 06:36 PM. Just back from a 2 day event and I'm running into braking problems. RE-71 R tires on 18" wheels, Redstuff pads on Meyle drilled rotors. When the brakes are cool for the first 5 laps or so they are nice and smooth. After that, as they get hot, the start to shudder getting progressively worse. I' thinking to switch to yellowstuff or perhaps pagid orange as well as adding the gt3 vent ducts. Any opinions on this? It's likely that your rotors are warping from the heat. How is the braking in normal driving after the track day? Is it okay, or is there still shuddering? I bought a set of really cool drilled and slotted Chinese rotors on eBay for the remarkable price of $100 for all four. They were great on the street, but on track they started shuddering after about two laps, and even if you took it really easy, they shuddered like crazy. Once back on the street, they were fine. I ended up getting a set of Meyle rotors (non-drilled, I have a 2.7 model) in the hope that I won't have any more warping issues. I'll find out shortly, I'm going to a track day this Friday at Pacific Raceways, which is very hard on brakes. My last event there I faded my EBC greens, so I moved to reds. On e they cool down, they are fine again, even on the track. That is almost the same setup I'm running - RE-71R on 19" wheels, EBC Yellow Stuff, and gt3 vent ducts. I haven't had any problems with brake fade on track days. Edit- add Meyle drilled rotors also. Okay, I'm in! Just ordered my Yellowstuff pads. Note to Canadian friends: Tdot Performance has these in Canadian dollars, free shipping, no duty or brokerage! Porsche dealer has the ducts in stock for $5.80 Canadian! Yay! 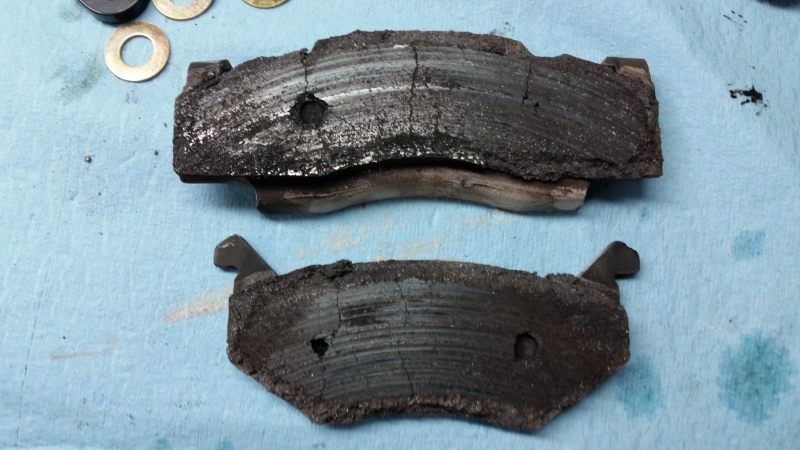 99 out of 100 times, brake shudder comes from pad material being transferred to the rotor. Pad material transfers when the rotor exceeds the operating temperature of the pad. EBC Yellows are a good pad for any track car on street tires (read: not R-compound). They do wear out quickly during track use, but they have a great progressive feel once up to temperature. Be warned though, their friction coefficient (amount of bight they have) at lower temperatures is noticeably less than at operating temperatures. Finally, I am happy to hear that nobody has recommended Carbotech brake pads. With EBC Yellows, I could get 8-10 hours of track time on one set of pads. Meanwhile, these POS Carbotech XP24s looked like this after just 7 hours. Last edited by Bayley; 05-24-2017 at 12:22 PM. Wow! Man, that is ugly! On inspecting my rotors (Meyle) today, I noticed that there seems to be an irregularity in the thickness of the disk as you rotate them. There is some friction from the pads on part of the disk and less as you rotate it. I first thought that it was warped but when I put my calipers on it, there seemed to be a variation in thickness. Strange. To be varified. 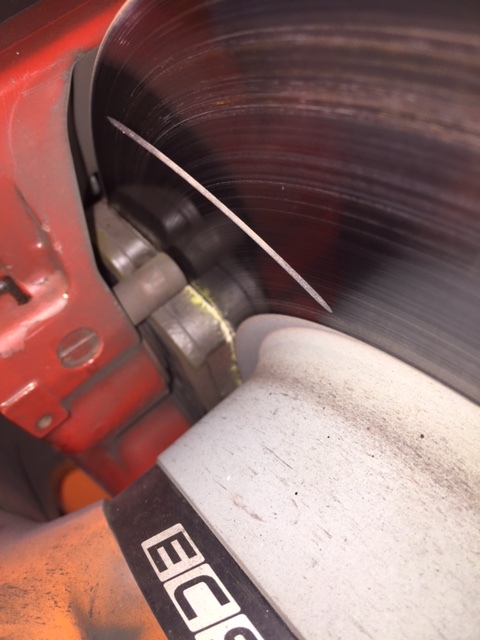 When I had an issue with "warped" rotors on my daily driver, I came across this article - Warped Brake Discs and Other Myths of the Braking System, The author says discs don't warp, but pad material accumulates irregularly around the disc surface which is what the disc runout really is.